Properties in Duncan average 4.8 out of 5 stars. Property 5: Cozy Cottage- Ocean View, beach access with a lookout grass bluff. Property 15: Orchard Cabin - A Cozy Cabin in a Peaceful Orchard Close to Ganges. Property 31: Eagle's Nest Cottage - Come And Relax On Beautiful Salt Spring Island! Property 33: Cowichan is Calling you out to PLAY! 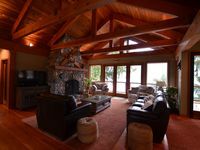 Property 38: Original Shawnigan Lake Cottage with GORGEOUS LAKE VIEWS! Spectacular ocean views. Private beach. Abundant Wildlife. Winter stormwatching! Property 46: Spectacular ocean views. Private beach. Abundant Wildlife. Winter stormwatching! A Place For Us - Unique Island Glamping Experience for the adventurer in you! Property 47: A Place For Us - Unique Island Glamping Experience for the adventurer in you!